We are celebrating the start of the new season with a pop-up event in our shop. We are excited to be hosting the launch of Justine Tabak's new Spring womenswear collection. Justine shares our passion for quality as well as entirely British design and manufacture. Her designs are timeless, simple and easy to wear, and will become cherished items in your wardrobe. 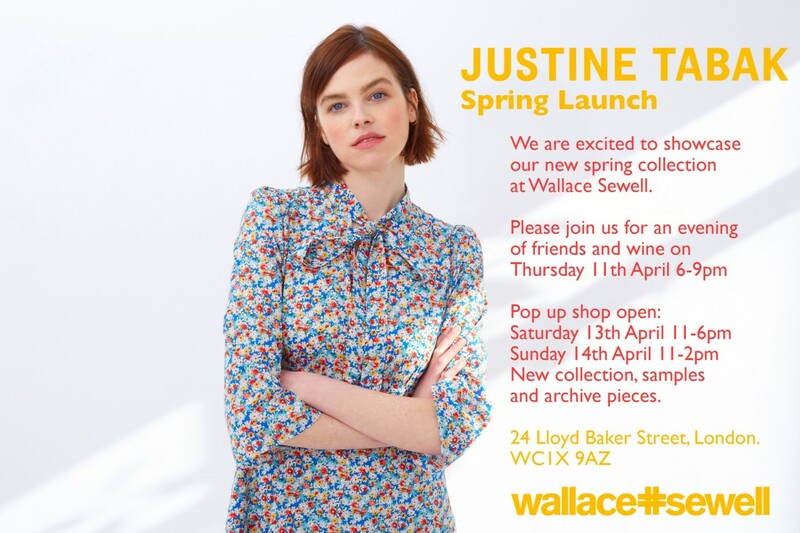 Alongside the new collection, there will be garments from Justine's annual sample sale, some from her archives and of course a range of gorgeous Wallace Sewell spring/summer scarves! We would love you to join us on Thursday 11th April from 6 - 9 pm to browse the new collection over a glass of wine. The pop-up shop will officially be open on Saturday 13th from 11 am - 6 pm and Sunday 14th from 11 am - 2 pm.